I. The officers of the club shall consist of a President, Vice President, and Secretary & Treasurer, who shall be elected by a plurality of votes at stated meetings in January and June. II. The offices of Secretary and Treasurer shall be filled by one person, who shall attend to the joint duties of both. III. The President shall preside over the meetings of the Club, and give the casting vote. In his absence these duties shall be performed by the Vice President. IV. 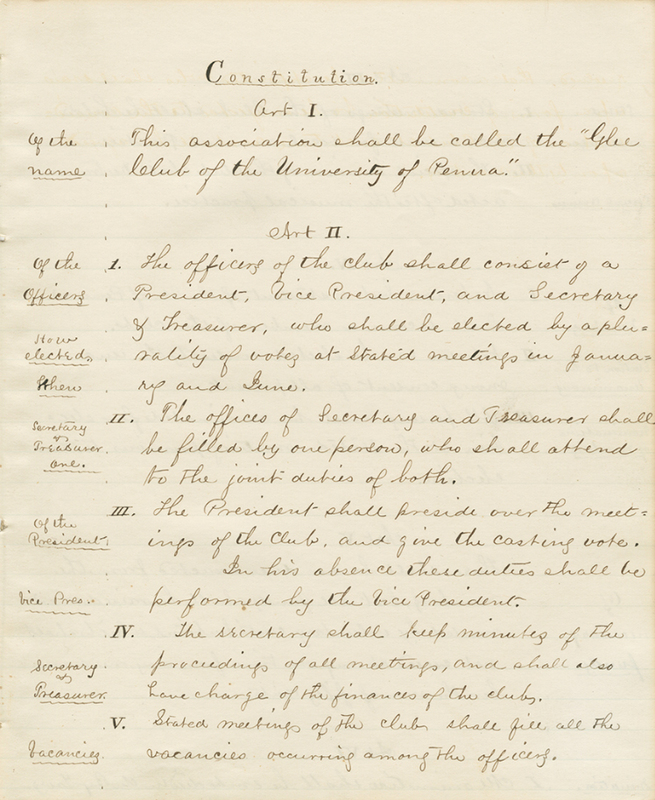 The Secretary shall keep minutes of the proceedings of all meetings, and shall also have charge of the finances of the club. V. Stated meetings of the club shall fill all the vacancies occurring among the officers. I. Stated meetings of the club shall be held once a week for vocal musical practice. II. The special business of the club shall be transacted after the musical practice. I. No person but a student of the U. of Penna. shall become a member of the club. II. No person can be elected unless by the unanimous consent of all present. III. All persons must be nominated for election at the stated meeting previous to their election. There shall be no dues exacted from the members, but all funds shall be raised when needed by voluntary contributions, which shall not exceed at any one time from any member the sum of fifty cents. All minutiae shall be embodied in the By-Laws. 1. The meetings of the club shall be held on Monday evening at eight o’clock, practising to be continued one hour and a half. 2. No entertainment shall be given at the stated meetings. 3. All elections shall be by ballot unless especially provided for otherwise.